From 1st to 5th April we exhibited at Hannover Messe, the world’s leading industry trade fair. 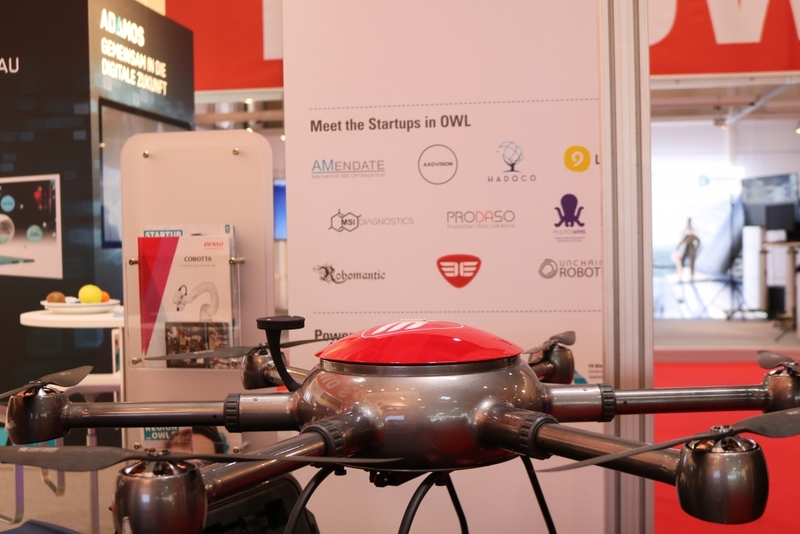 We were part of the STARTUP REGION OSTWESTFALENLIPPE joint stand where a total of 10 startups presented innovative approaches to artificial intelligence, robotics, additive manufacturing, warehouse management and the use of drones. We were able to present our ConVecDro and our projects to potential business partners, school classes as well as political parties. We received a lot of positive feedback from visitors and had a fantastic week in Hannover. Thank you it’s owl and OWL Maschinenbau for this opportunity! From 1 to 5 April, the Hannover Messe, the world’s leading trade fair for industry, will take place. Over the course of five days, 6,500 exhibitors from 75 countries will present key technologies from Industry 4.0, Machine Learning, 5G and Smart Grids. At the STARTUP REGION OSTWESTFALENLIPPE joint stand, a total of 10 startups will be presenting innovative approaches to artificial intelligence, robotics, additive manufacturing, warehouse management and the use of drones. We will be there with our ConVecDro and show you what applications are already possible with our drone, why pilots are soon superfluous and what advantages the drone has over traditional methods. We look forward to seeing you and to many interesting conversations! Last Thursday on 14th February the Hinterland of Things Conference 2019 took place in Bielefeld. It is a platform that connects innovative start-ups and international mid-sized companies to create a unique Internet of Things ecosystem in the heart of Ostwestfalen-Lippe. We were part of the exhibition area where 17 start-ups in the fields of Software-as-a-Service (SaaS), Internet of Things (IoT), Robotics, and Artificial Intelligence (AI) presented their companies and products. 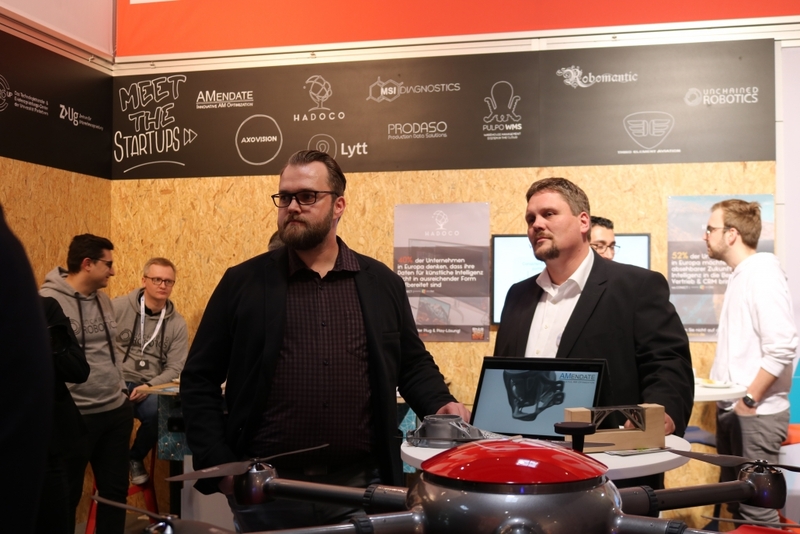 The Hinterland of Things Conference gave us the opportunity to network and to discuss our drone applications with entrepreneurs, investors, potential clients and the general public. We had a great time at Hinterland of Things! On 14th February the Hinterland of Things Conference 2019 takes place in Bielefeld and we will be part of the exhibition! The Hinterland of Things Conference is a platform that connects innovative start-ups and international mid-sized companies to create a unique Internet of Things ecosystem. Over 40 speakers from all over the world will share their insights on two stages, the winner of the Rocket Mittelstand Award will be announced, and numerous startups, investors and corporates will be there for you to meet. The exhibition area gives you the opportunity to discover what startups in Germany and Europe in the fields of Software-as-a-Service (SaaS), Internet of Things (IoT), Robotics and Artificial Intelligence (AI) are working on. Come to our stand and you can be your own drone pilot! Learn about our exciting use cases and see that drones can do much more than taking photos of your vacation spot. We will show you why drone pilots will soon be dispensable and which drone applications are already possible! We look forward to meeting you at Hinterland of Things! Thanks to our drone ZF is now the first company in Germany to use automated drones to transport goods on its plant premises. 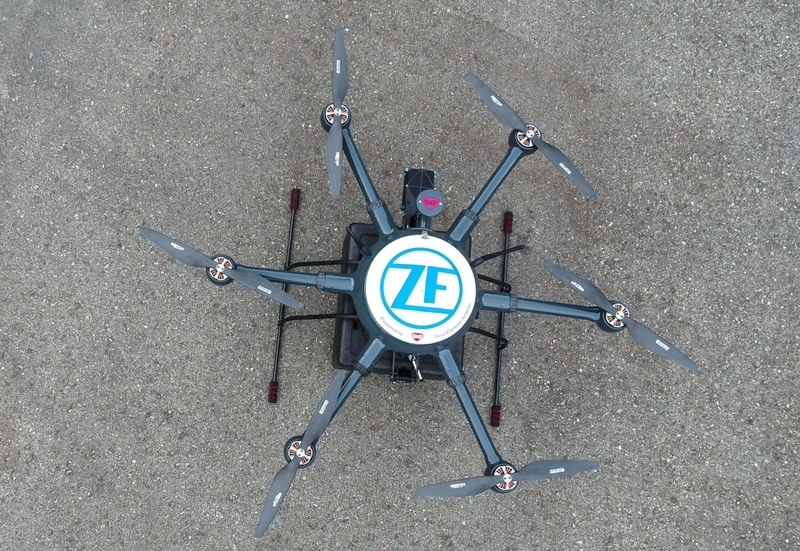 The drone prototype with a custom user interface and a 4G LTE solution has recently started flying spare parts such as sensors or control cards from the central warehouse to workshops. As soon as the test flights are complete and drones properly deployed, such flights will relieve vehicle traffic at the plant and save time on the up to one kilometer-long delivery routes that are often on the upper floors of buildings. The 30 km/h hexacopter can transport up to three kilograms payload and offers around 30 to 40 minutes of electrical flight operation. It is a safe and redundant system which is of course water and dust proofed. The automated drone flights would not be possible without the official approvals for automated drone flights from the Stuttgart Regional Administrative Authority and the German Air Traffic Control DFS. Drones, mostly equipped with cameras, could until now only be used privately or commercially for tasks such as mapping, monitoring factory fences or surveying. This is now the first case in Germany where automated drones are used to transport goods on plant premises. We were at the official project kick-off of our landmine project in Brussels. Together with the humanitarian organization Handicap International “Humanity and Inclusion” and our other project partners, we will test the use of drones in landmine clearing in Chad in Central Africa. The country, located south of Libya, has been contaminated with mines since 1982 on an area of estimated 100 million square meters. Using drones, the dangerous zones can be overflown to confirm or disprove the suspicion of mines. This makes the landmine search not only much safer, but also much faster and more efficient. Exactly one year ago, on 26th June 2017, we decided to become the Third Element Aviation GmbH. A good reason to celebrate! A lot has happened in the passed year: our first successful product ConVecDro went on the market, we were at the “Hannover Messe”, moved to our new location, got new team members, found new business partners and initiated many new projects. As a result, we do not only offer mapping and surveying solutions, but also support for pilots during offshore challenges and innovative solutions for the detection of landmines with radar technology. Everyday we put all our effort into the implementation of these exciting projects to expand our service portfolio. We look forward to the future with many more fascinating ideas and challenges. https://3rd-element.com/wp-content/uploads/IMG_2875-1.jpg 4000 6000 Chiara Wöhle https://3rd-element.com/wp-content/uploads/2017/07/3Element-2.png Chiara Wöhle2018-06-26 09:16:092018-07-20 12:08:00It's our birthday! As of today, we are happy to present our new offices at Oeko-Tech Park Bielefeld. The old water tower from 1926 has been part of Windel Bleaches for many years. Today it is part of a modern industry park with approx 100 companies on site. Our new offices can be found at level 4, 5 and 6 of this impressive building! Further, we are now able to do demonstrations, tests and workshops on site, with a magnificent landscape of industry roofs, chimneys, grass areas and old pipings. 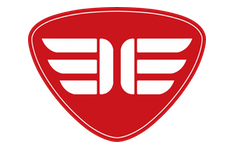 Together with Definetz e.V., Third Element Aviation is the new technology partner for project Defikopter. The innovative and exciting project has been part of CEOs Benjamins Wiens’ and Marius Schröder’s career for several years already. “With the ConVecDro technology platform we have achieved many features that are crucial for Defikopter applications – from a rain proof chassis over an extended range of up to 15 kilometers to innovative safety features. 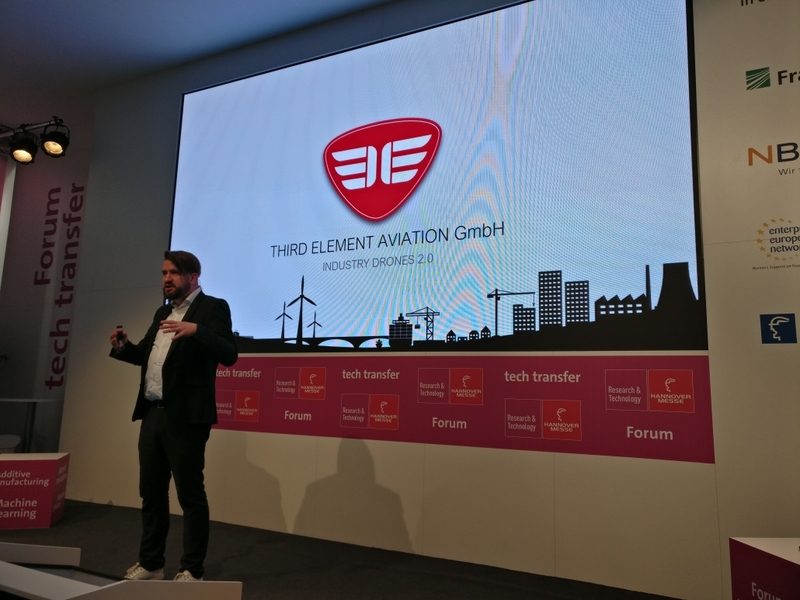 It makes us proud and happy to see Third Element Aviation being on board in this project” says CEO Marius Schröder.